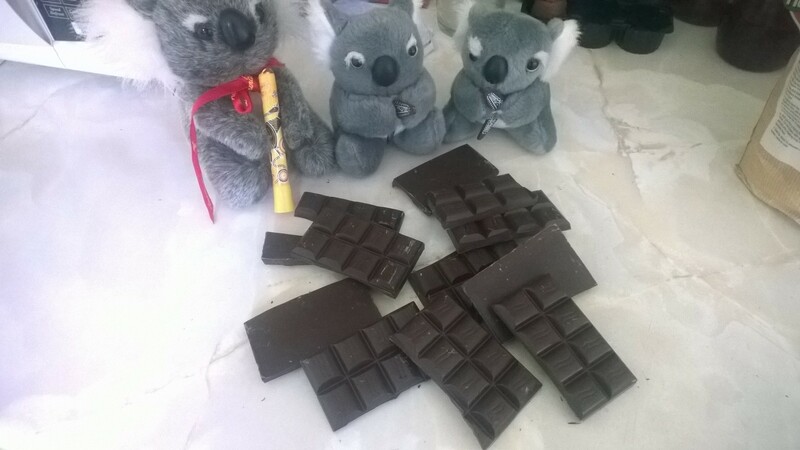 Hello Koala fans, its been a while, hasn’t it? Things have been gathering pace recently in other parts of my life. I’m applying for a job in Bournemouth, which may lead to a permanent place, the possibility of a new flat and hopefully a new kitchen that I can work out of. In addition, I’m going to be starting a course on psychotherapy and counselling at the local college in Poole. 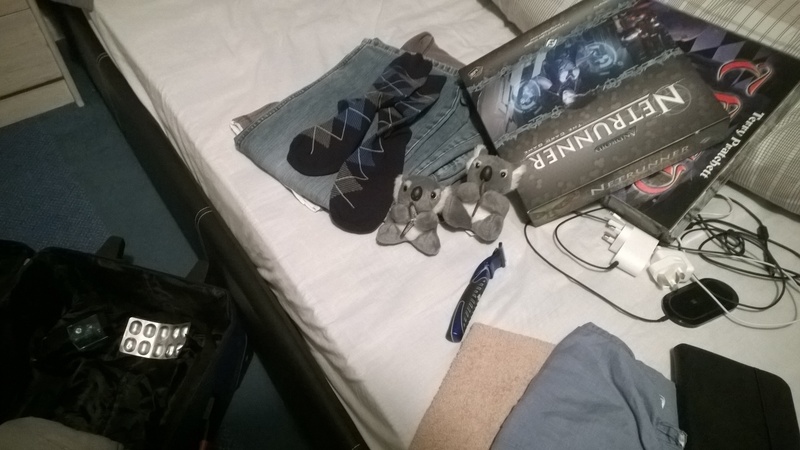 It will involve a lot of homework and will be pretty difficult for me, both academically and for personal reasons. Essentially I’m going to have my nose in a book for a long time to come and I don’t know what kind of impact it will have on the blog. Some take it a little more literally than others. 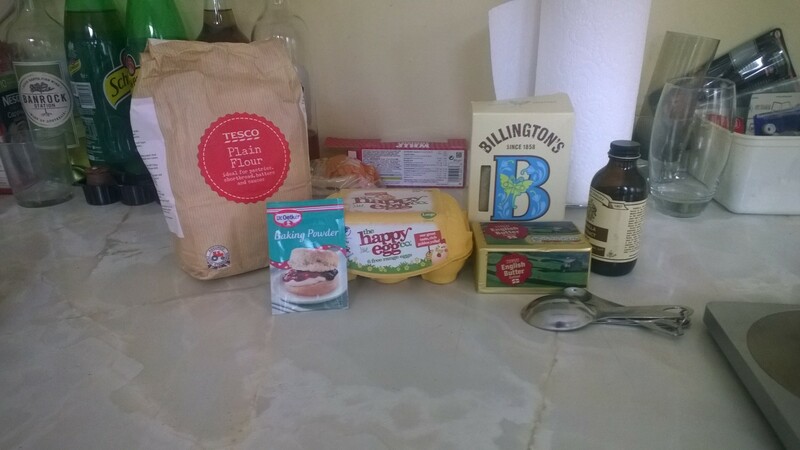 I didn’t have a lot of time to get ingredients together for this week’s episode, so I decided to have a rummage around in my ingredient cupboard to see what I had, and then hopefully match it to a recipe from one of my books. One thing I did have a lot of in my cupboard was chocolate. 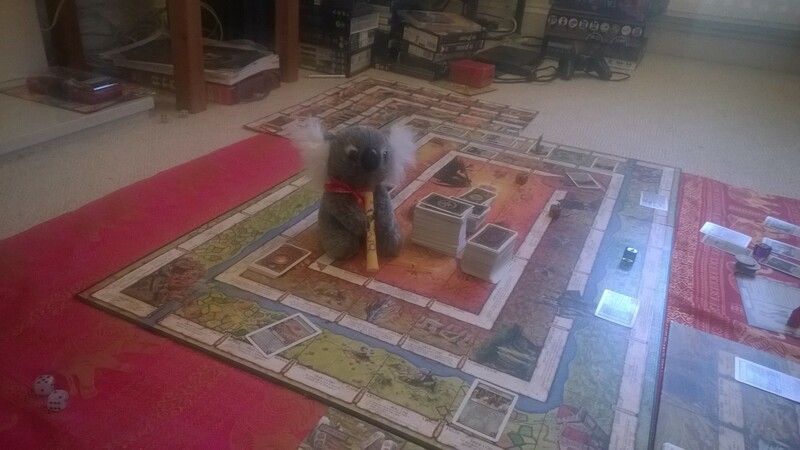 I took another look at the book the Koala was wedged in earlier. In it, there was a recipe for “chocolate flush” cookies. These cookies blur the boundary between what could be classed as a biscuit and a brownie and have this wonderful appearance that reminds me of shattered earth and rivers of lava. Hence why I tend to think of them as molten cookies. 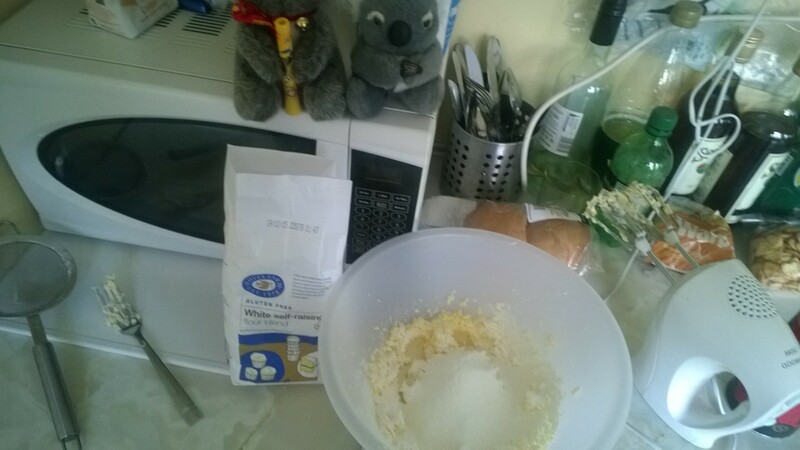 Sugar, butter, flour….Wait, where’s the chocolate gone? The first step is to melt the chocolate and butter together over a low heat. As usual, you need to make sure you do this over a saucepan of water, without letting the chocolate bowl touch the boiling water. Slowly stir in the sugar. I can’t find the bit in the recipe about “bubbling ominously” though. 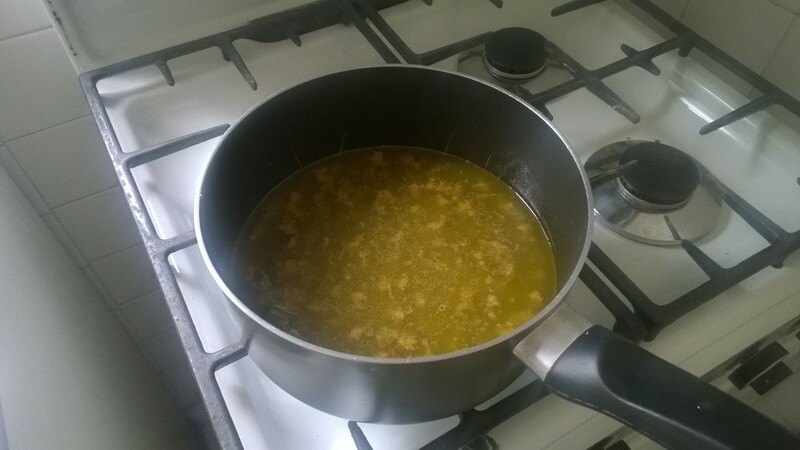 While the mixture is still warm but *not* boiling, the eggs need to be added. If you add them one by one while mixing in between, it makes their consistency a lot more even and for these cookies, this is critical. The temperature is also important as you don’t want to cook the eggs in the melted chocolate mixture. So – warm, but not hot. Add the vanilla to the mix as well. 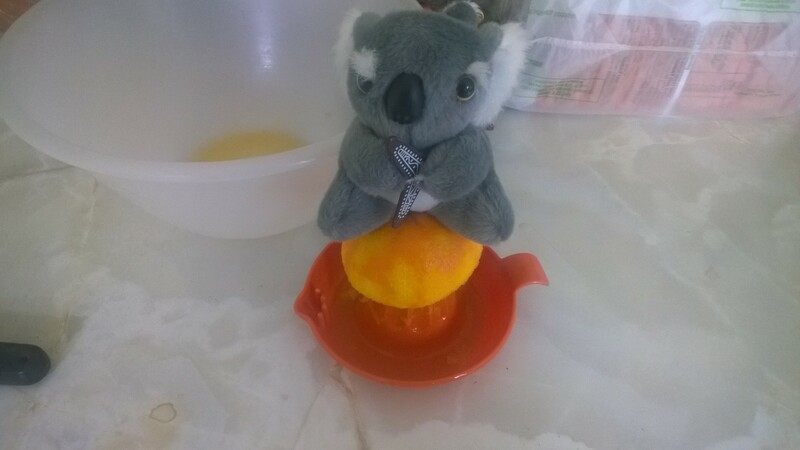 Stirring is hard when you’re perched over the rim of a bowl. 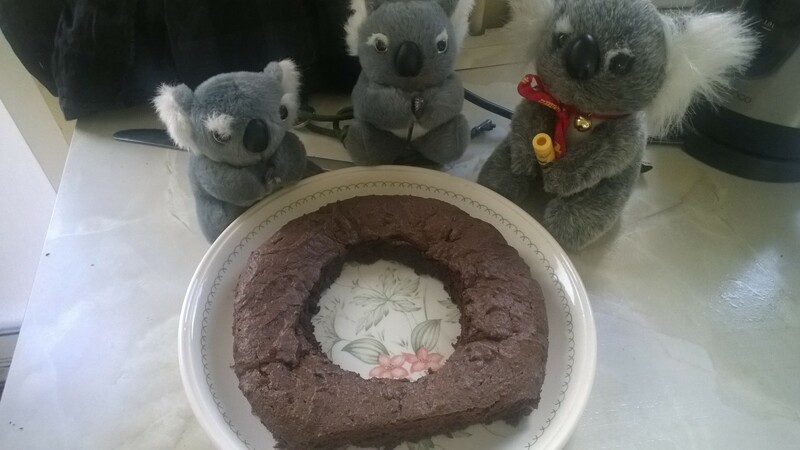 The next bit is a little more straightforward and just involves combining the dry ingredients, which is to say the cocoa, flour, baking powder and salt until you have something that looks like the picture above. 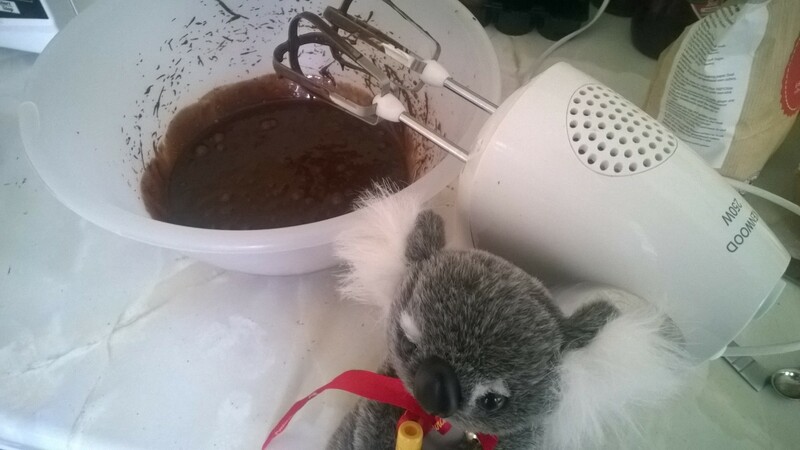 While the recipe in the book states to add the chocolate mixture to the dry ingredients, I chose to do it the other way around – adding small amounts of the dry mix to the chocolate and stirring frequently. The risk of doing it the other way is that it tend to clump together and needs a lot more stirring to even out. Once everything is combined, it needs to sit in the fridge for an hour or so to chill completely until firm. 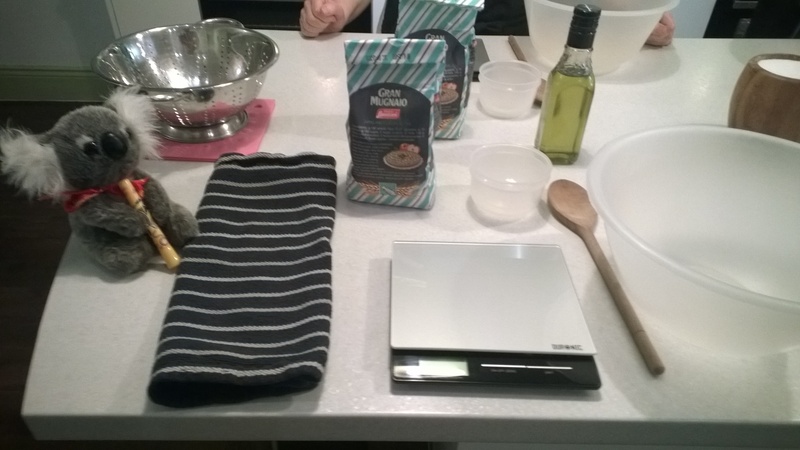 Finally, set your oven to Gas Mark 3, 160*C, 325*F or whichever arcane temperature scale you prefer and put small balls of the cookie mix on to a baking tray. Bake for about 10-15 minutes, so that you’re looking for smooth areas with the little fissures running through them. The high chocolate content of these cookies means that they do spread out far, so make sure the mixture balls are well spaced on the baking tray or the above happens. Despite not being particularly neat, the cookies turned out quite well. A little rich for me but they went down well with the folks at work. No one was really sure whether they were cookies or brownies but they certainly vanished quickly. 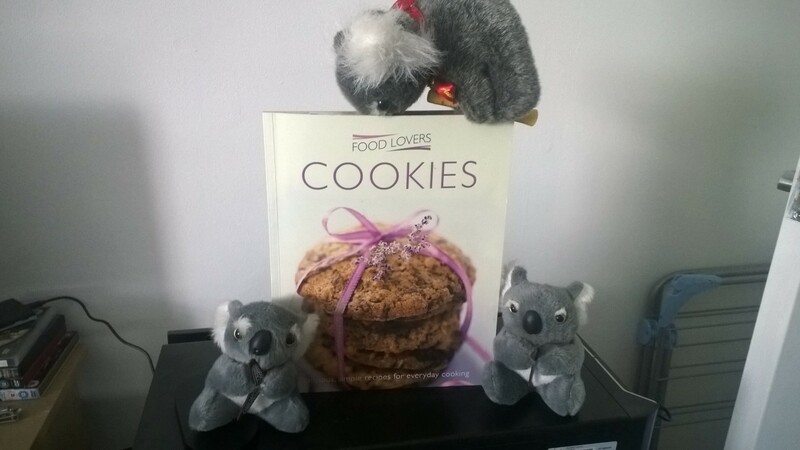 The cookies in small, medium, large and Koala sized portions. My friends at work had been quite supportive of me recently, so I decided they would be the recipients of this week’s baking. Whether they would be lucky or unlucky recipients was still to be determined. 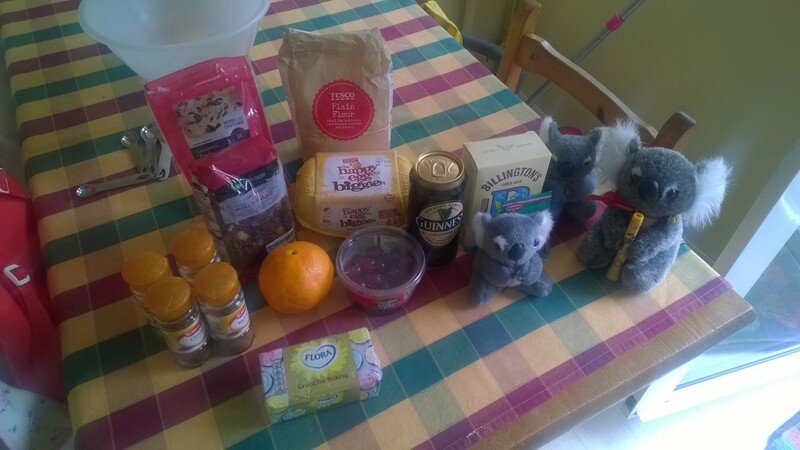 In order to make a porter cake, first of all you need to abduct a hospital porter, which is handy given where I work, then you need a large meat grinder…..
Keeping up to date on currant events. I was starting to panic a little at this point. The recipe doesn’t exactly call for a mountain of flour, so I was worried that the cake batter would be very runny. Once the mixture was starting to boil though, it was a very different matter. The smell that was coming from the pan was *incredible*. It was a rich, fruity smell with spicy tones, tangy zest from the oranges, the smell of freshly mown grass- wait, what? 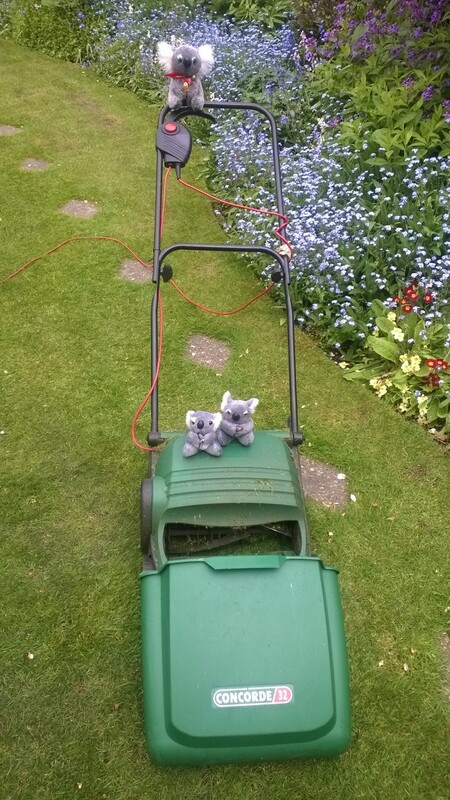 Luckily for me, the joyriding trio stopped just short of Mum’s flower beds. 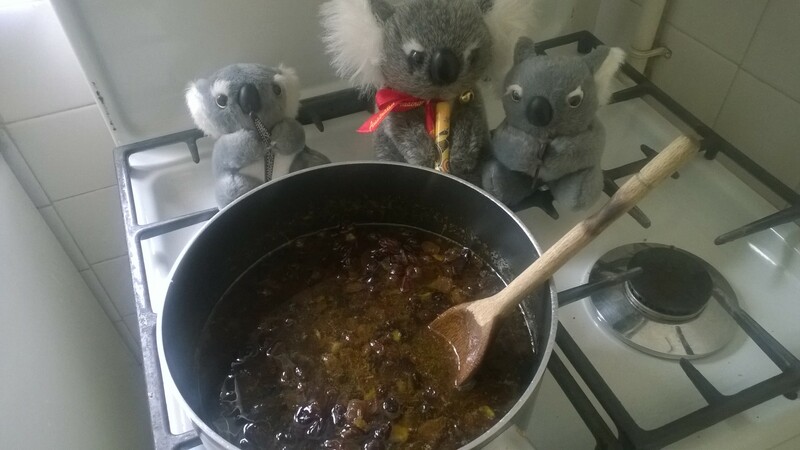 As we made our way back to the kitchen, the fruit mixture in the saucepan was ready to have the final ingredients added to it. 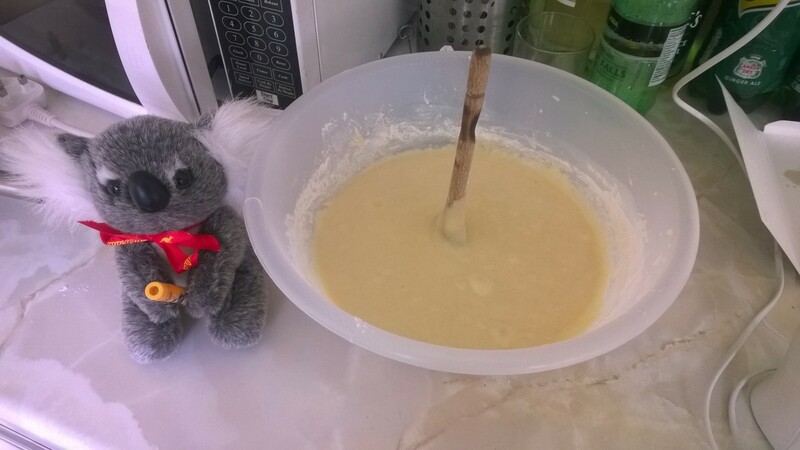 By this point, a lot of the fluid had boiled away, so although it was still a lot more runny than my other cake mixtures, it started to look “workable”. 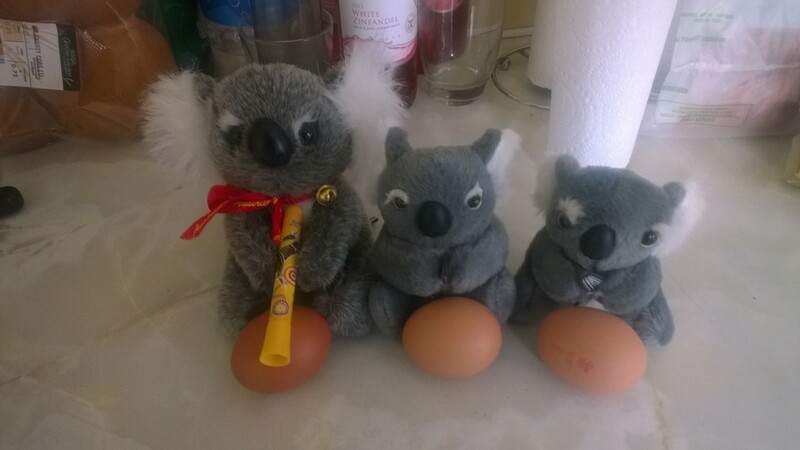 The flour was slowly stirred in and the Koalas offered to help with the eggs. They were egg-stremely sorry for almost wrecking the garden. One other difference between porter cake and most others is the length of time it takes to bake. Most cakes usually stay in the oven for about 30-40 minutes on a high temperature. With this one, it needed a very low temperature (Gas Mark 2/130*C) for one and a half hours. Even then, I left in the oven for an extra 30 minutes as the centre failed the spike test. 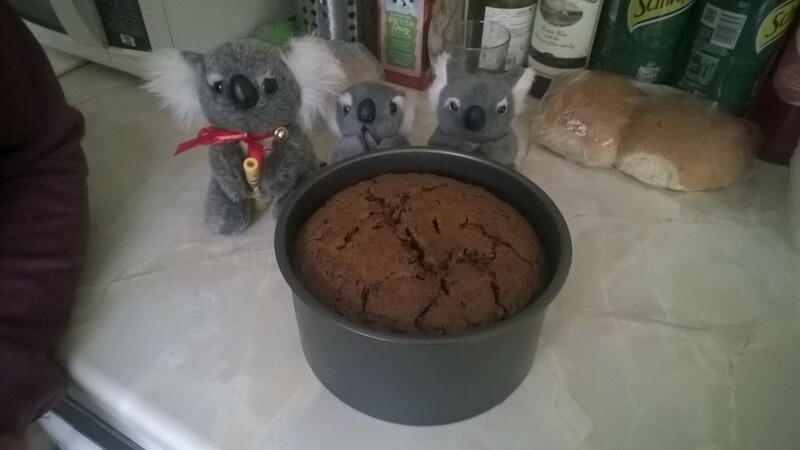 I left it in the baking tin for journey home to make it easier to carry, plus the extra heat from the tin would continue to bake the cake gently. 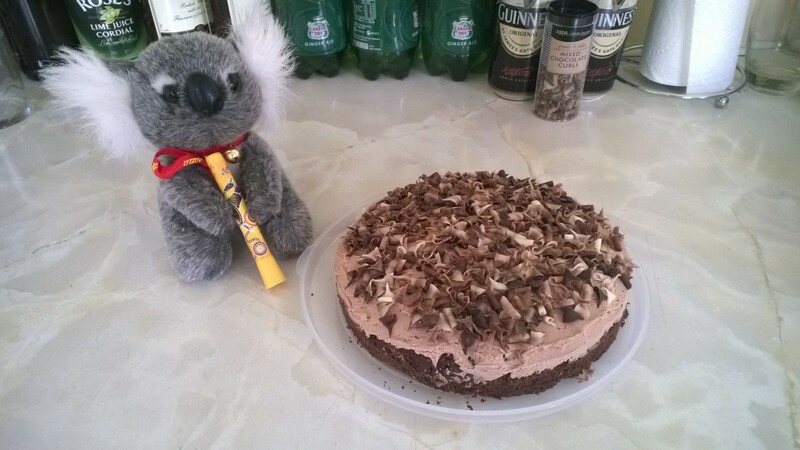 The cake went down really well with the folks at work; I received quite a lot of positive feedback about it. The slice I tried was firm enough to pick up, with the sponge being moist and light. Its different to something like a Christmas cake, where the sponge is often extremely dense and sits on the stomach like a bowling ball. 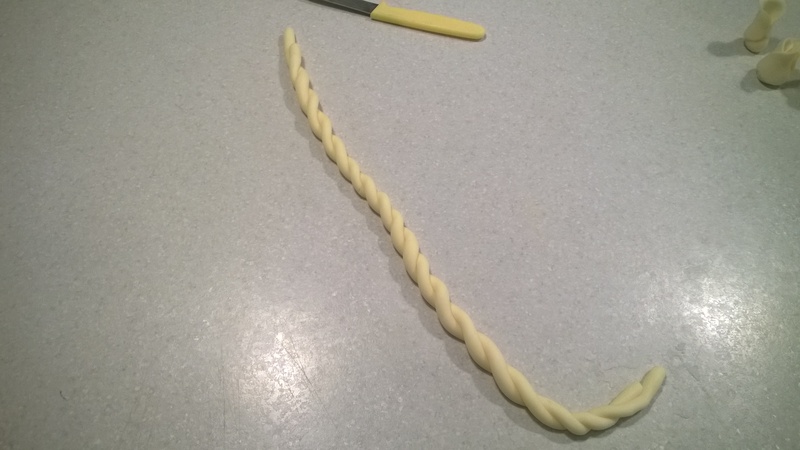 Entry 42: What Are Glutens Anyway? Like most people, I’m vaguely aware of gluten-free stuff but no idea what’s actually involved with it or what I need to avoid. There was a slight, yet adorable, delay in looking up gluten-free recipes on the internet. 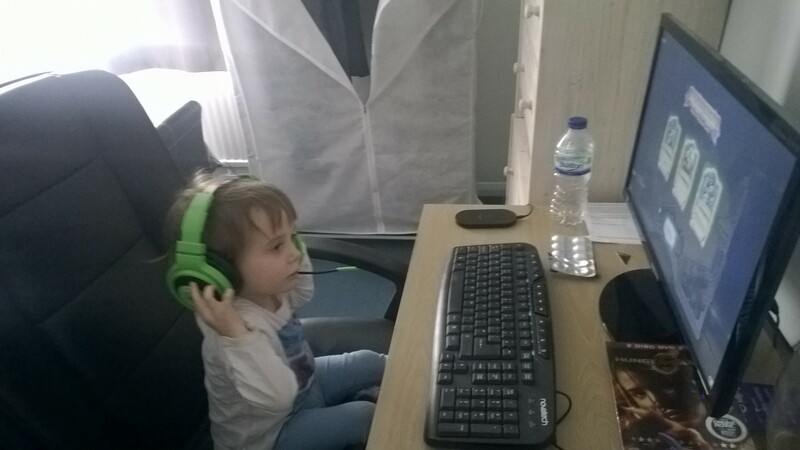 My niece receiving her first experience of youth-corrupting video games. I chose to go with the chocolate cake recipe. 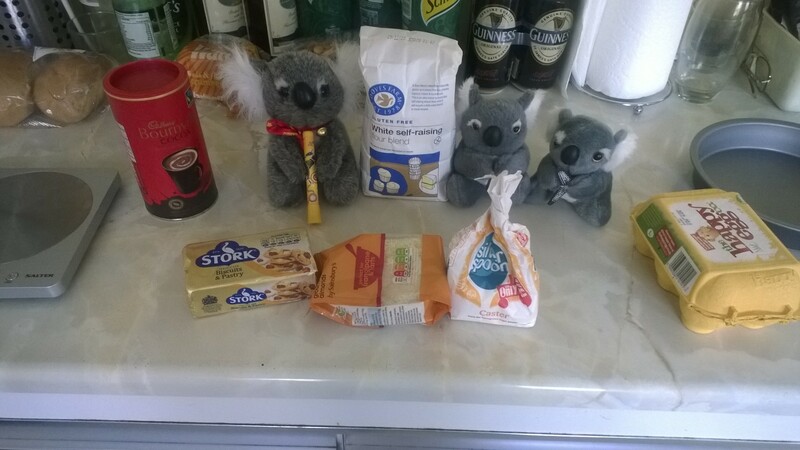 I also tried to enlighten the Koalas about coeliac disease and gluten fibres but I think I just ended up making them confused. No, that’s the zergling I ordered off eBay. Glutens are a type of protein found in cereals such as wheat and rye. They cause an allergic reaction in people with coeliac disease, leading to stomach pains and other intestinal unpleasantness. Zerglings are creatures in StarCraft that rip through solid steel and eat people. 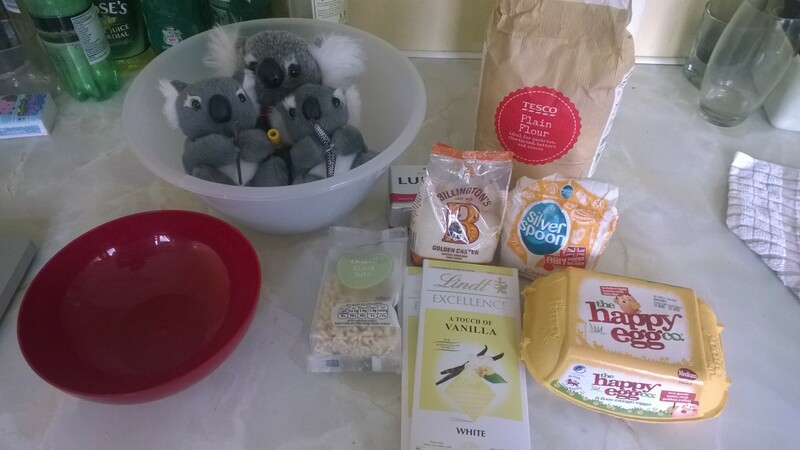 While the Koala was setting a new world record for the 100 metre sprint, I assembled the ingredients to work on Zel and Nash’s cake. 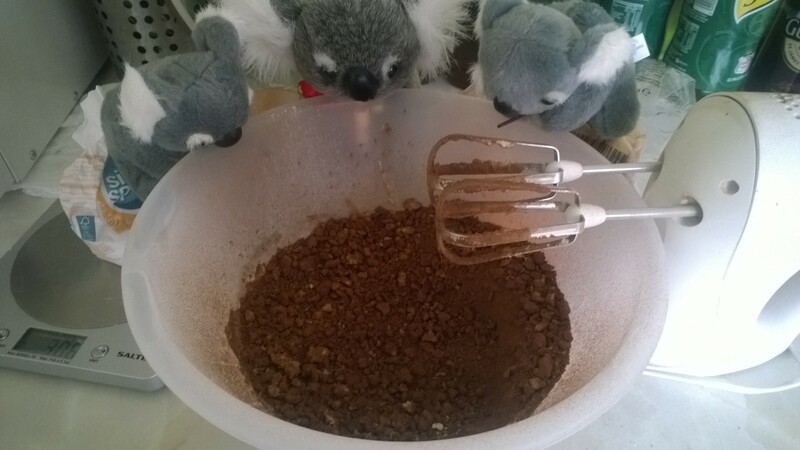 Eagle eyed readers may notice an extra ingredient in that photo – ground almonds. As I was reading up on gluten-free cakes, I often found comments that they were very dry compared to standard sponges. Mixing in a small amount of ground almonds can help to restore some of the missing moisture that comes from using gluten-free flour. 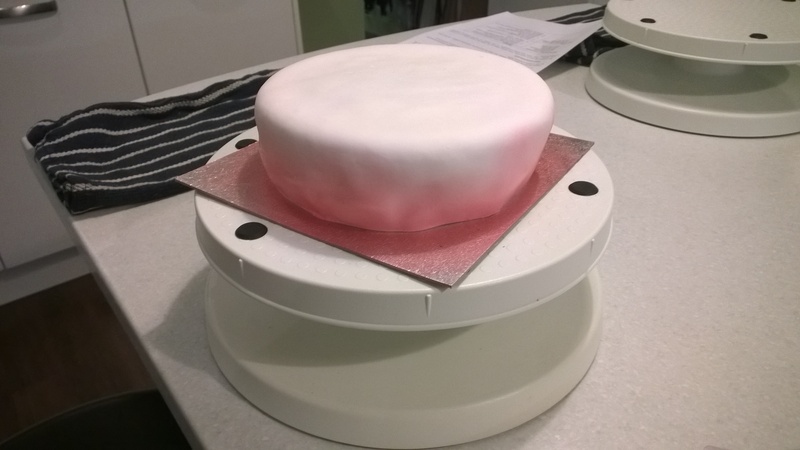 Another hazard is that gluten helps to give a sponge cake form – as a cake rises, the gluten fibres start to form in the cake, trapping air and helping to make the cake firm. It can be helpful to use a little extra baking powder, even with self raising gluten-free flour, just for the extra security. Sugar and butter. Gluten-free doesn’t necessarily mean “slimming”. The gluten-free flours is interesting stuff. Despite being made from things like maize, tapioca and potatoes (! 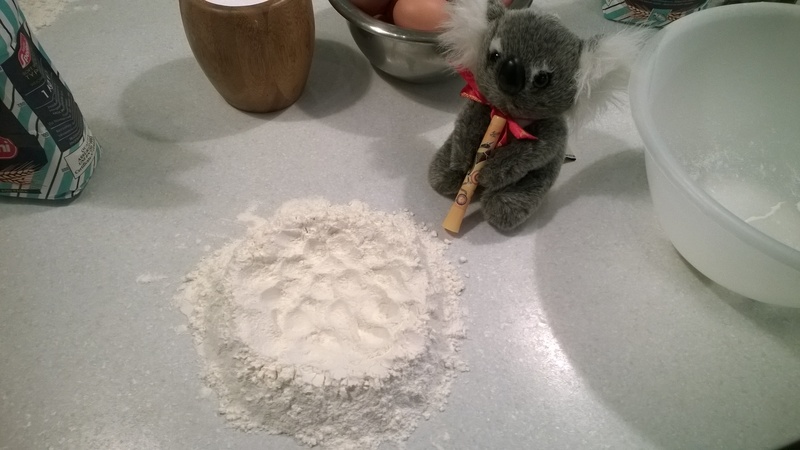 ), it’s identical to work with as normal flour. I imagine that’s one of the things that scares people off about specialist baking like gluten-free or nut allergies; that they will find themselves in completely unfamiliar territory. Reassuring though it was to work with, whether it would actually *taste* like a normal sponge cake was still a cause for concern. And so *another* 40 minutes later, I finished *another* gluten-free sponge and decorated it. I’ve been off work for the past couple of weeks. Nothing to panic about – just needed a little personal space for a bit. Also decided to use the time to visit a friend of mine in Peterborough. As always, I felt that as my friend was nice enough to put me up for a couple of days, the least I could do in return was bake some goodies for the occasion. Now that I had a little extra time, I decided to try a recipe I’ve been to do for a long while now – blondies. A blondie is essentially a white chocolate version of a brownie and as regular viewers will know, I’m rather fond of brownies in all their various forms. Their mix of dense flavour and potential for modifications with cherries, nuts, alcohol makes them extremely versatile. Would blondies measure up to the same standard? 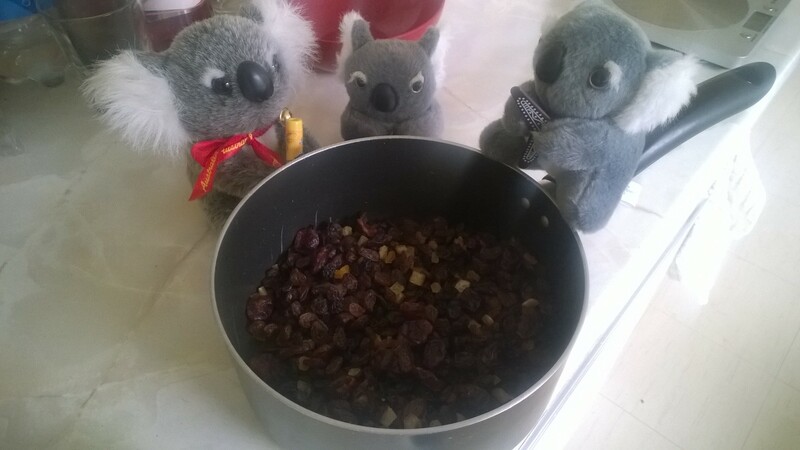 You three do realise that each time you take over the bowl, I have to spend ten minutes cleaning the fur out of it? I’ve always been a little wary of working with white chocolate – it probably stems from attempting to make those white chocolate truffles back in Entry 2. White chocolate has a very different melting temperature to normal chocolate and it is also considerably sweeter. All I could hope was that whoever had written up this recipe had taken both of these things into account. 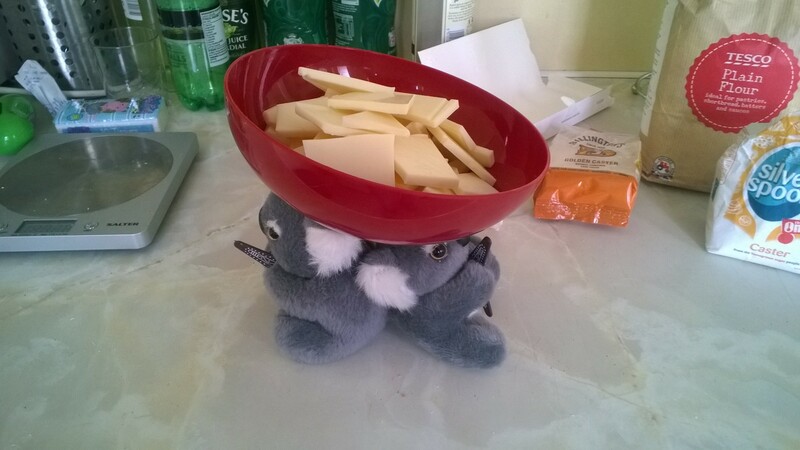 The Great White Chocolate Heist of 2015 was foiled after the thieves couldn’t agree on an escape route. 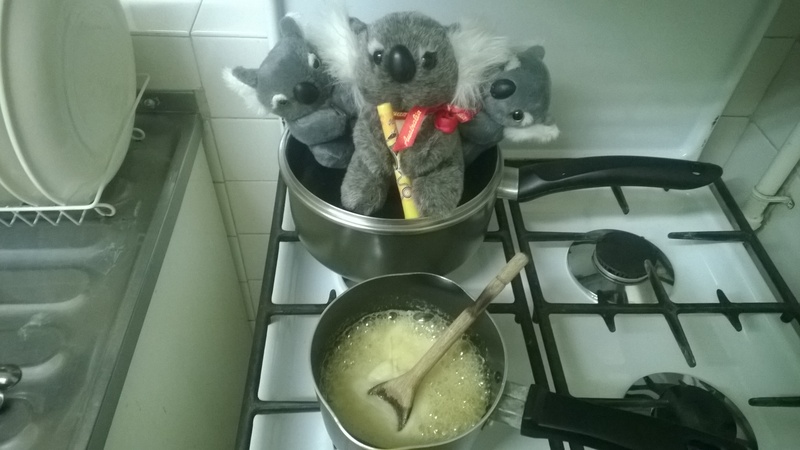 Once I’d rescued the chocolate, I tipped it in to the molten butter and after a few minutes, added the sugar as well. 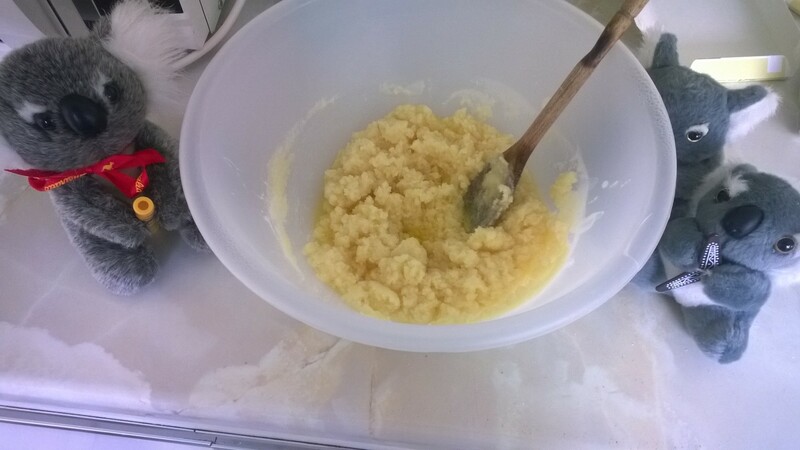 While the mixture was largely coming together, I could see a small amount of the liquid butter in the bottom of the mixing bowl. This was starting to feel very wrong. 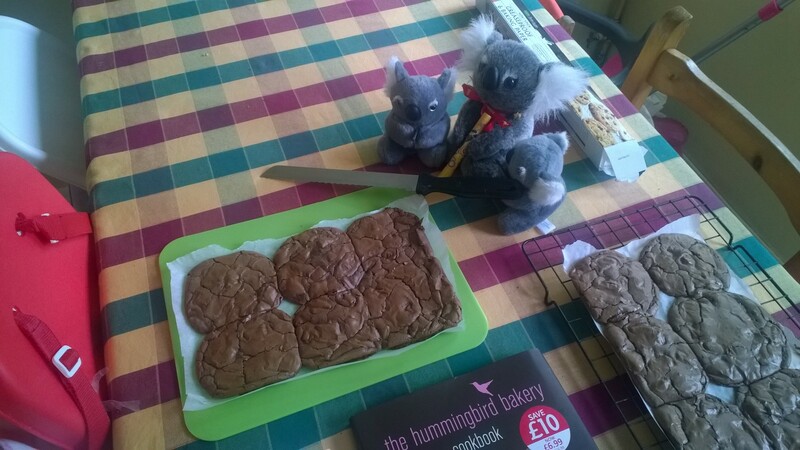 I hope to see both of them again soon – hopefully with a much better cake next time! There’s also a little good news for my ever patient readers – the next entry with all of its various photos has already been done, so you shouldn’t have to wait so long for the next entry. 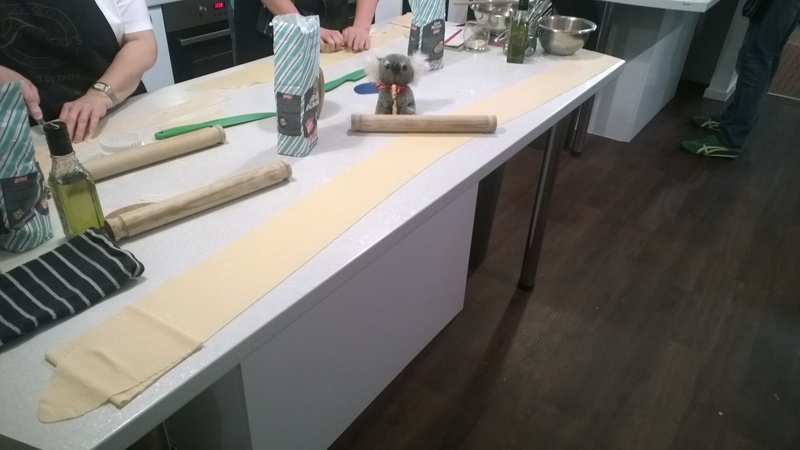 Following on from last week’s lesson at Flavours Cookery School in Bournemouth, I was back there again last week for a lesson on pasta making. 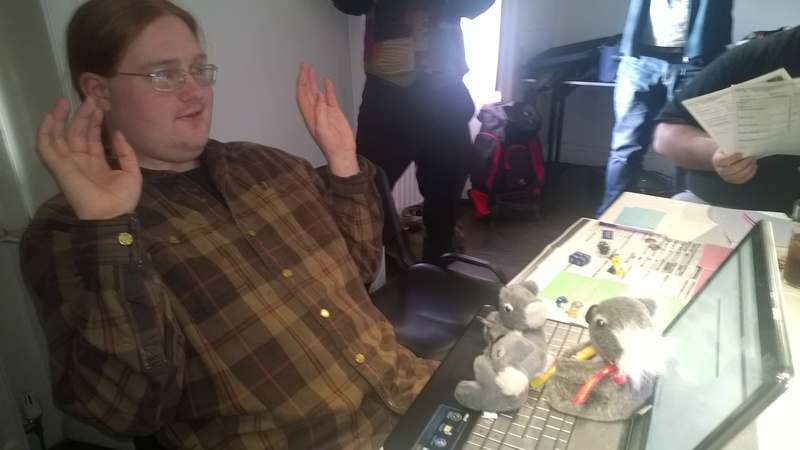 This time though, I was not alone…. 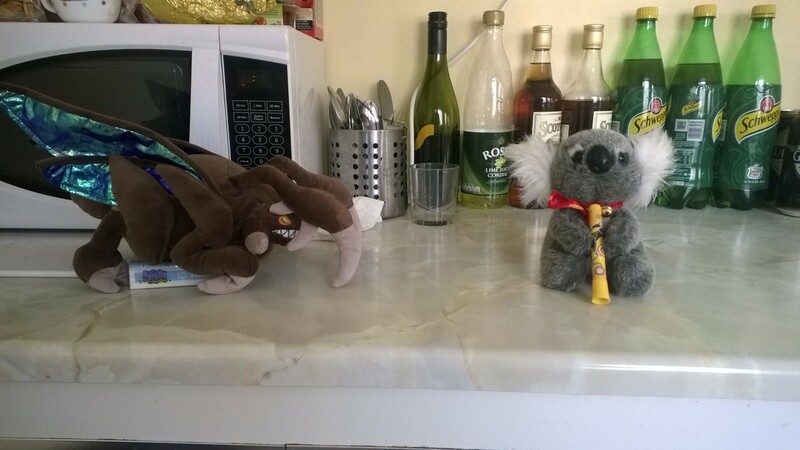 In order to minimise disruption, it was *just* the Koala that had tagged along; the Twins were still holding down the fort back at my parent’s place in Hampshire. 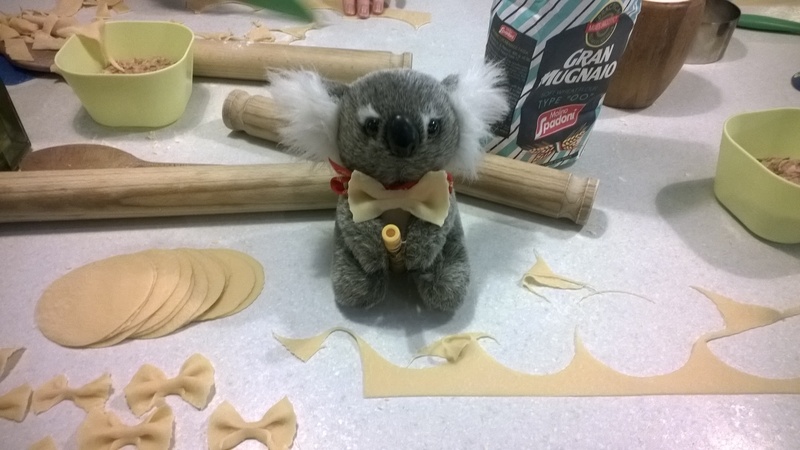 The lessons was going to go right back to basics; teaching us how to make good quality pasta dough and using it for fancy things like tortellini and ravioli. 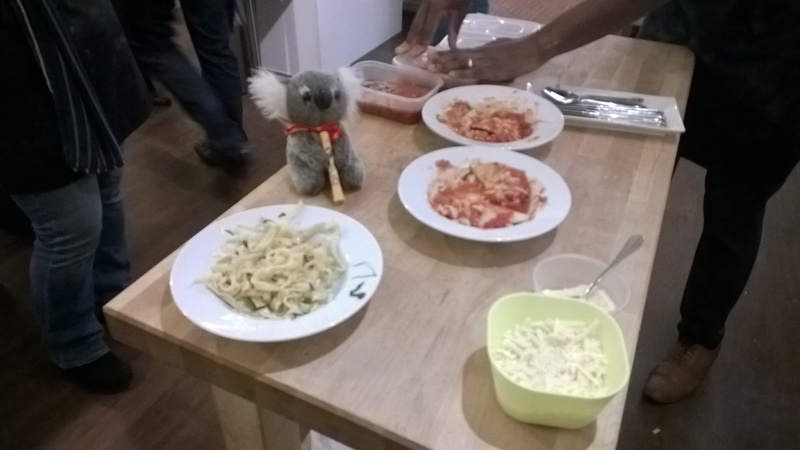 Before any of us could even ask, our teacher, an enthusiastic and friendly chef called Des, talked to us about black pasta. Black pasta is not some kind of evil dark side equivalent of pasta, eaten only by Sith Lords and Bond villains. It is normal pasta that has been mixed with a large amount of squid ink. It looks quite impressive but doesn’t really do much for the flavour. Although if you use squid ink from *this* source, forget everything I just said. It was a useful thought. 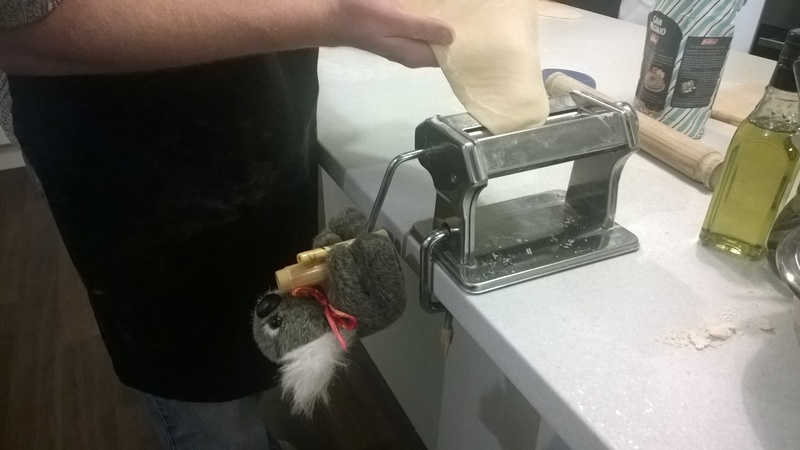 When we bake and cook, we often go to great lengths to make sure it looks fantastic or wild and exciting. The primary purpose of food is to be eaten and if something looks amazing but tastes foul then you’ve kind of missed the point. A really good example of this is rainbow cake. In order to get the bright vivid colours needed for the colours, people overload on food colouring and the sponge becomes very unpleasant to taste. I’m guessing one of the reasons why the prices here are pretty good is because they make a lot of dough. …don’t look at me like that. You knew that joke was coming sooner or later. When they said refreshments would be provided, I don’t think they counted on having someone like this turn up. The pasta machine is like the old fashioned laundry mangles. 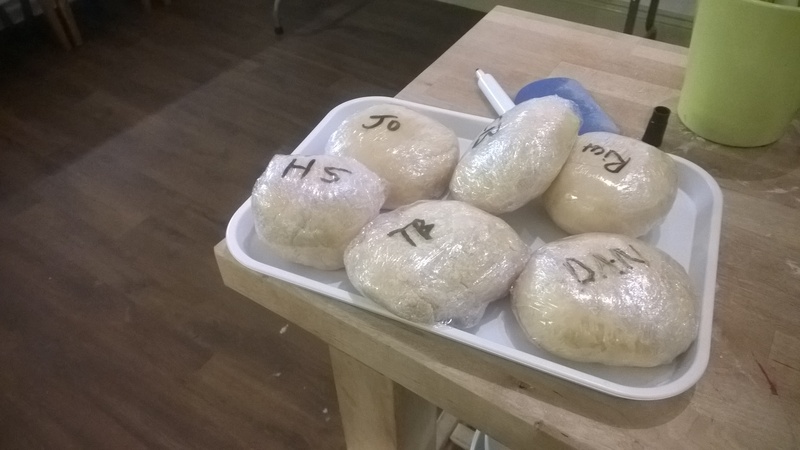 It’s a couple of rollers with a handle on the side, designed to stretch out the dough. 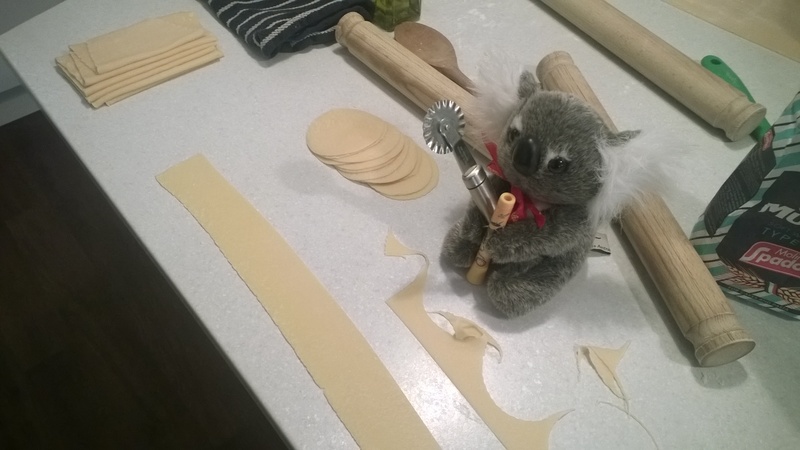 It allows you to make the pasta thin enough for cut-outs, like ravioli or tortellini, or long enough for spaghetti or parpadelle. 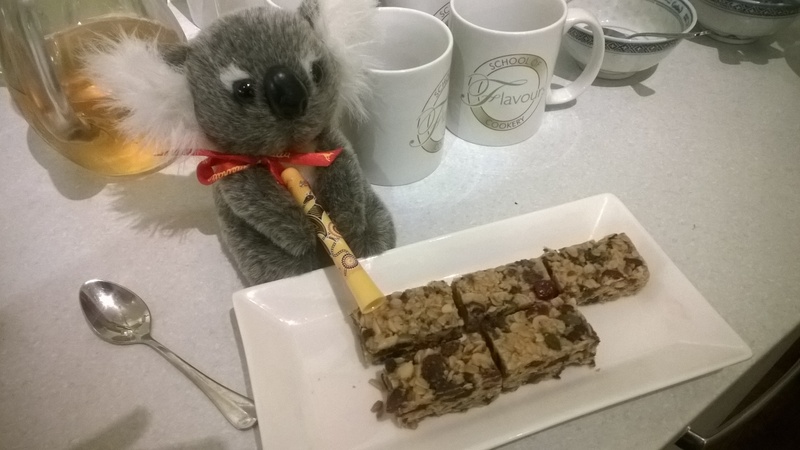 The Koala was rather cranky about being separated from the free flapjacks. One that wasn’t stretching was the amount of time we had to do all of this. 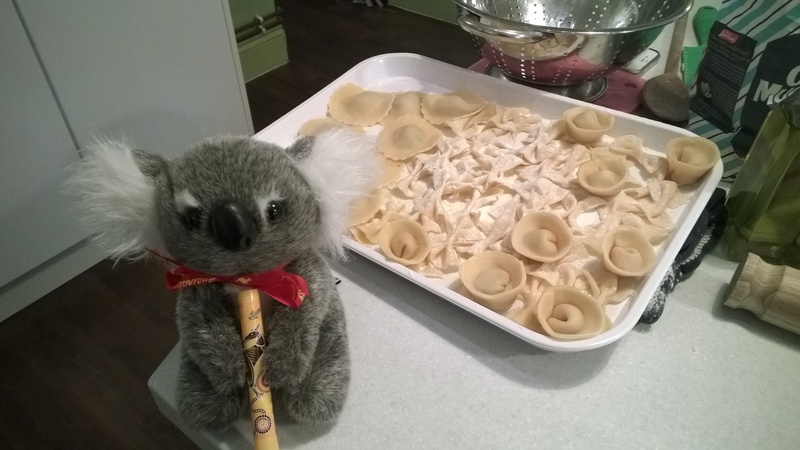 There were several different pasta types we needed to make: butternut squash tortellini, Italian sausage meat ravioli, “bow ties” and parpadelle. 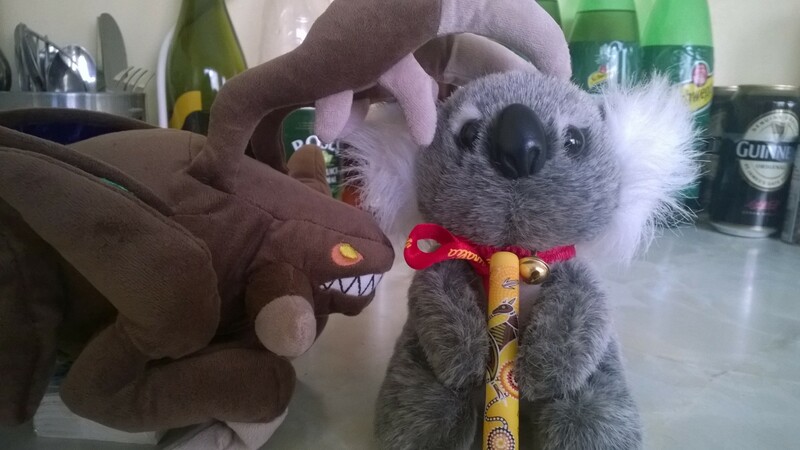 The Koala models a potential replacement for his ribbon. It’s like the Italian version of the Texas Chainsaw Massacre. The not quite finished pasta. There’s a final stage to preparing the pasta, known as blanching. This involves throwing your pasta into a large saucepan full of boiling water and waiting for it to rise to the surface. Then you have to fish it out and then immediately dunk it into another pan full of cold water. Once blanching is done, your pasta is fresh and cooks in a couple of minutes. It seems like a lot of trouble to go to, especially when you can get fresh pasta off the shelves or dried pasta out of the store cupboard. It certainly felt like hard work. 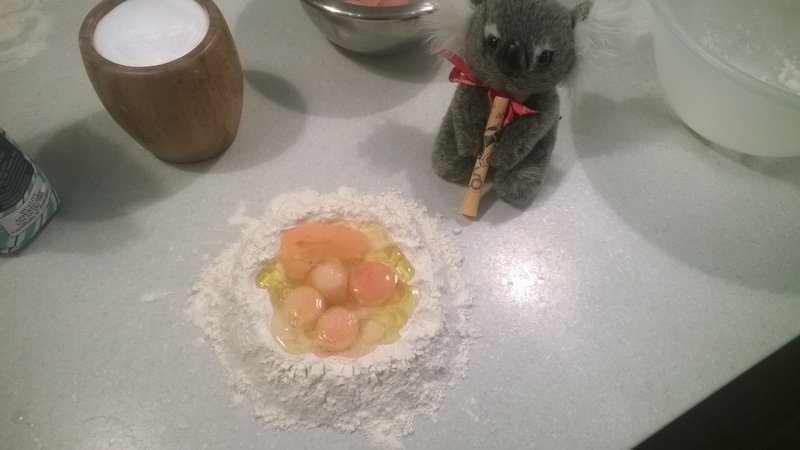 The difference in the taste though is enormous and given the quantities I made from that modest ball of dough, it’s a fantastic way to cook for a large number of people, while looking stylish at the same time. I’m not sure what I’ll choose for the next lesson from Flavours but whatever I pick, it promises to be fun. Things are going pretty well for me down here in Bournemouth and I’m feeling a lot more positive about life in general. There’s still the occasional rocky patch on the road but compared to this time last year, things are a lot better. When Life puts rocks in your road, eat an American dessert. However, that could soon be changing. 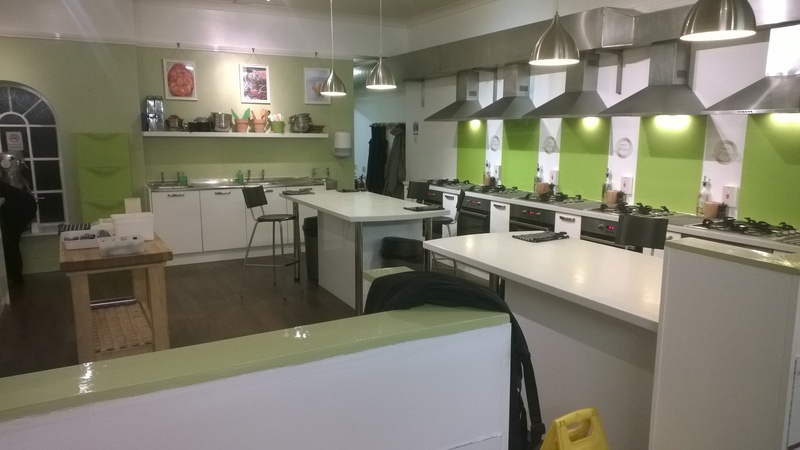 On my way into work each morning, I pass a small local cookery school which offers evening classes on all sorts of things, from pastries to pasta, curries to cakes – all kinds of interesting things. So this week, I finally bit the bullet and signed up for a couple of them. 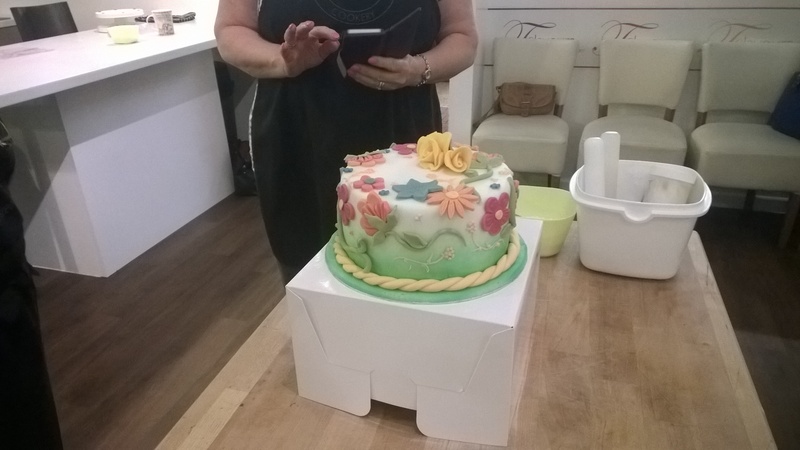 The first was a three hour course on cake decorating. 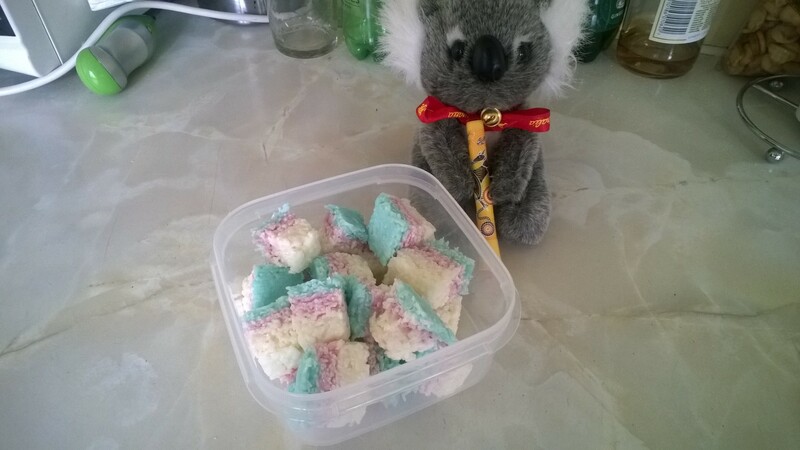 Sadly the Koala wasn’t with me for this particular adventure but given the ungodly amount of icing that was lying around unguarded, it’s probably just as well. A beautifully tidy classroom. Taking bets on how long it remains that way. You really think ours is going to look *this* good? 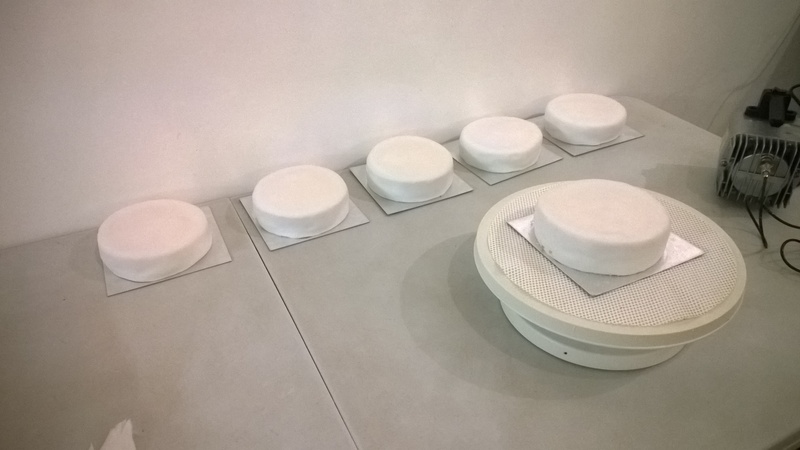 Five pre-decorated cakes. If you look carefully, it’s a polar bear having an accident with Tipex in a snowstorm. The first task was to add the misty looking colour underneath, using a special airbrush modified to take food colouring. Food colouring comes in a surprisingly wide range of textures – liquids, gels, pastes – each with a specific decorating task in mind. The airbrush looked quite formidable and we were nervous about using it. Eventually, a brave volunteer was selected by the rest of the class smartly taking a step backwards and me being slow on the uptake. I went with pink for my base colour, as I’ve grown to like bright and cheerful tones over the traditional manly colours of grey, black, charcoal and ebony. 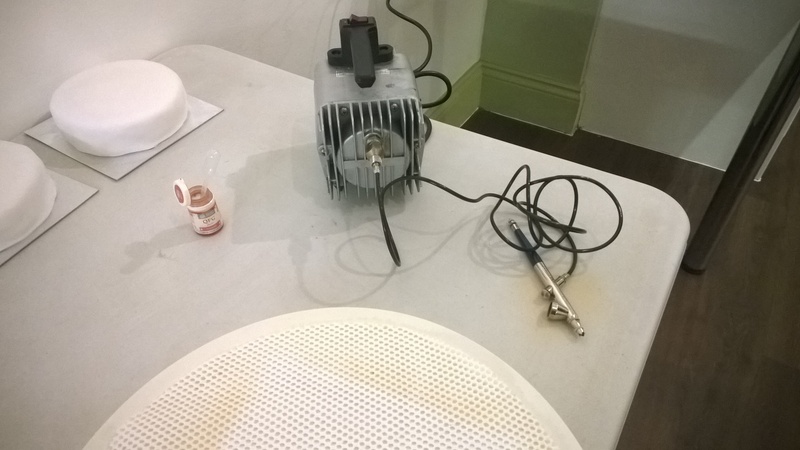 If you’re interested in getting a similar airbrush for your own decorating, the one I used is apparently about £300 but Hobbycraft and similar stores do a smaller handheld one for about £100 or so. The next stage involved making the roses for the top of the cake. This proved to be much more challenging. My mum is the gardener in the family; my knowledge of flowers is that they come in self raising or plain varieties. 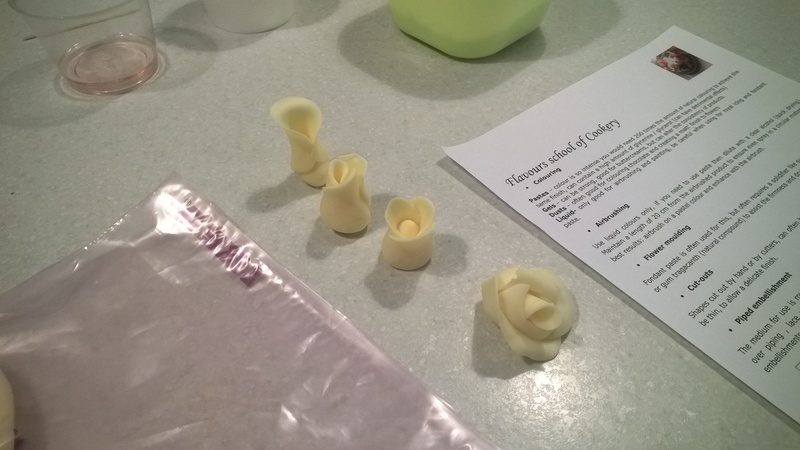 As a result, my finished flowers ended up as something vaguely rose-like, something that was probably an orchid and two others that have yet to be discovered by botanists. They all looked kinda cool though for a first effort. All them are classed as an endangered species, or will be when it’s time to chop the cake up. 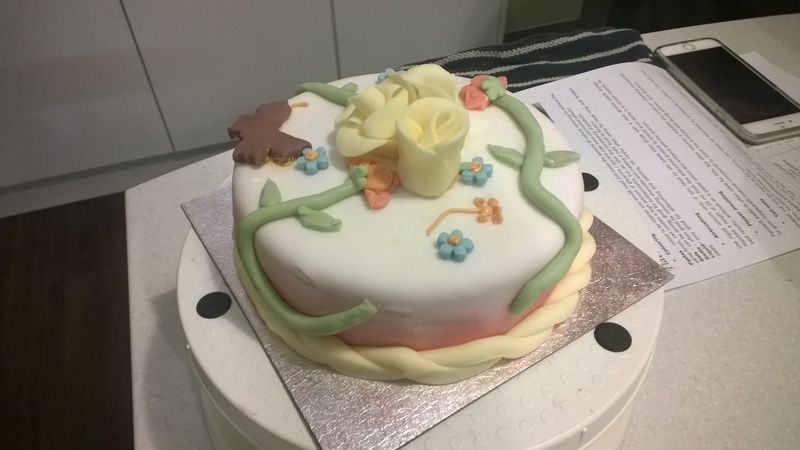 Several more additions followed – a wonderful little twisted rope pattern to line the base of the cake and some leaves and vines made using a similar pattern. There are two ways to persuade all these decorations to stay in place – one is by using alcohol to melt the sugars together and the other is by using a very tiny amount of piped icing. Vodka is used as its one of the purest forms of alcohol available that still leaves your vision intact after consumption. 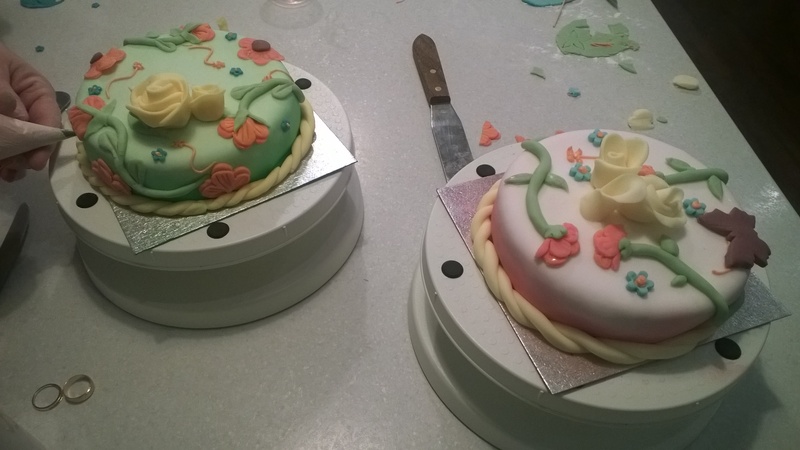 It works well for the smaller flowers but for the roses and vines, I found that piped icing gave a firmer hold once it had set. I hope I don’t get roped into doing this for my niece’s birthday every year…. 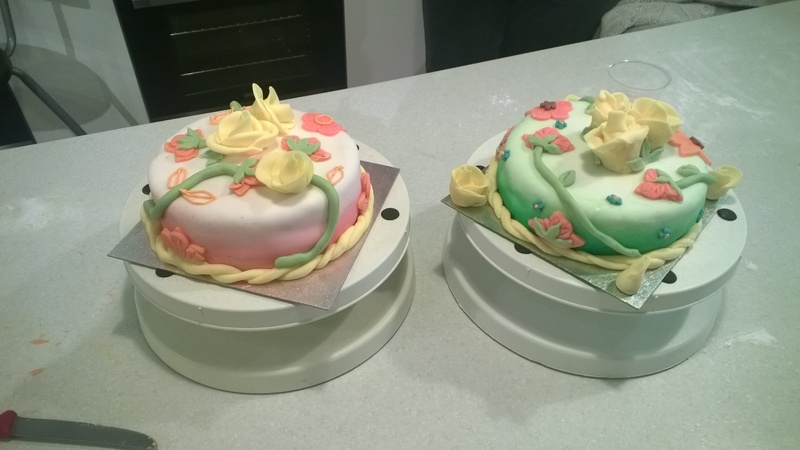 With kind permission, my classmates allowed me to take some photos of their cakes as well! 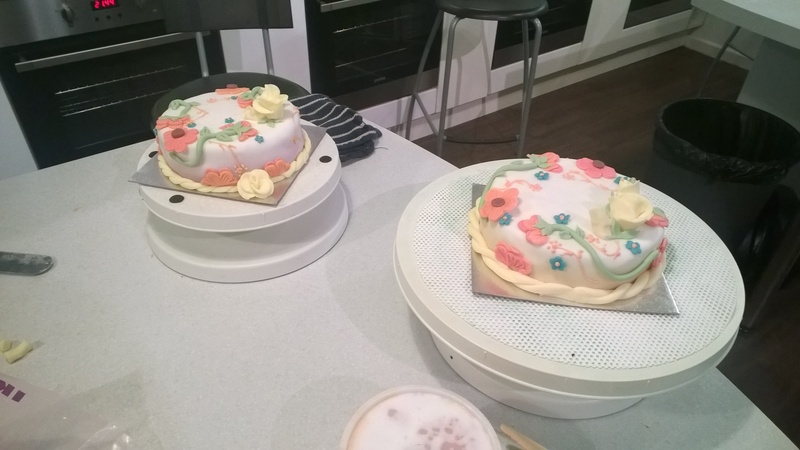 I really enjoyed the class and although it was a little more expensive than the sort of baking classes available through adult education centres, the small group sizes, the friendly and extremely helpful tutor made it excellent value for money. 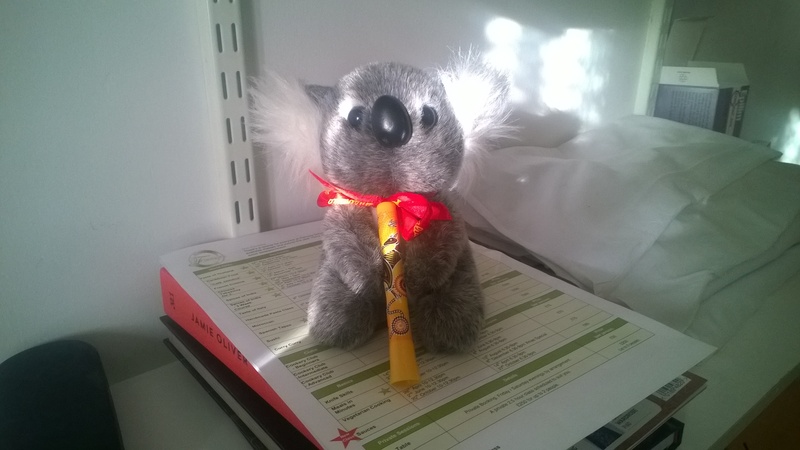 …and if there’s any classes you’d be interested in seeing the Koala attend, drop me a line in the comments and work/money permitting, I’ll see if I can go. See you again very soon folks! It’s finally good to be baking again, although this was something of a last minute job. Every so often, I travel to some wild and exotic part of the UK to meet up with some of my friends. However, as we didn’t have anywhere wild, exotic or interesting available to us, we had to make do with Newcastle. 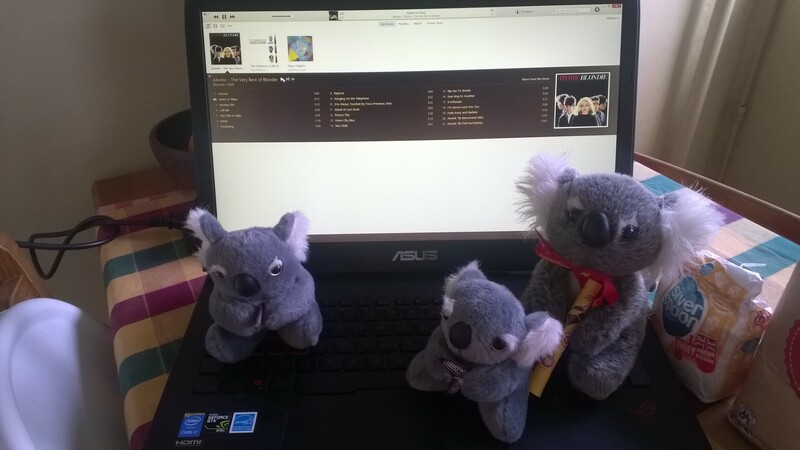 It’s not my first visit to that neck of the woods, although it is the first time I’ve been there with the Koalas. We had persuaded a local pub to loan us a room for the day, on the condition that we bought our food and drink from there. Although I couldn’t bake anything for the Saturday, there wasn’t anything preventing me from bringing something for the following day however. The last time I went to one of these meet-ups, I baked a raspberry and white chocolate cake for all of us. 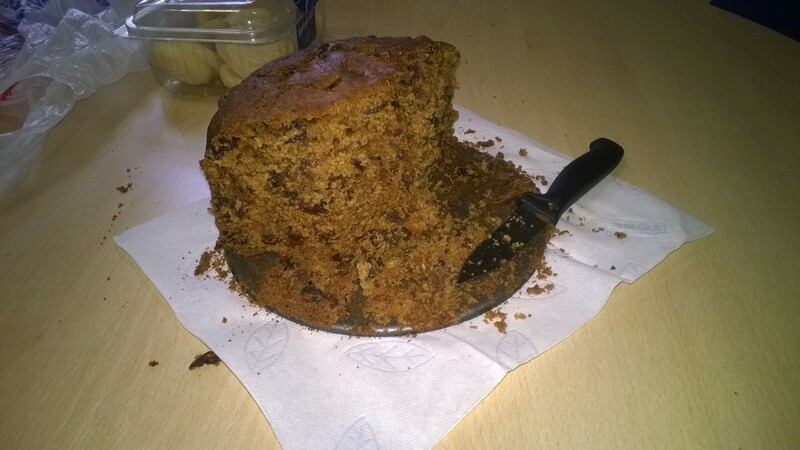 It went down well but I worried constantly about the cake collapsing on the way up. I was also going to be sorely pressed for time: I literally had one evening to make something before I had to leave for London at the crack of dawn the next day. 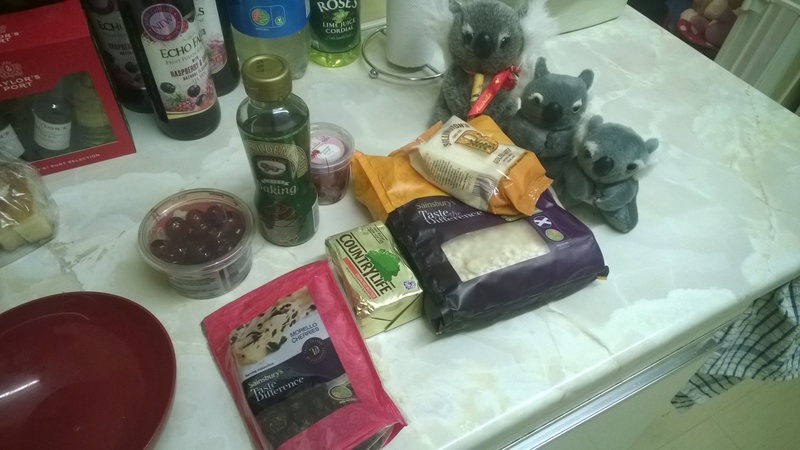 There were two contenders: cherry flapjacks and blondies. A blondie is essentially a brownie without the cocoa and a little additional white chocolate. In the end the flapjacks won but I will definitely be making some blondies in the not too distant future. 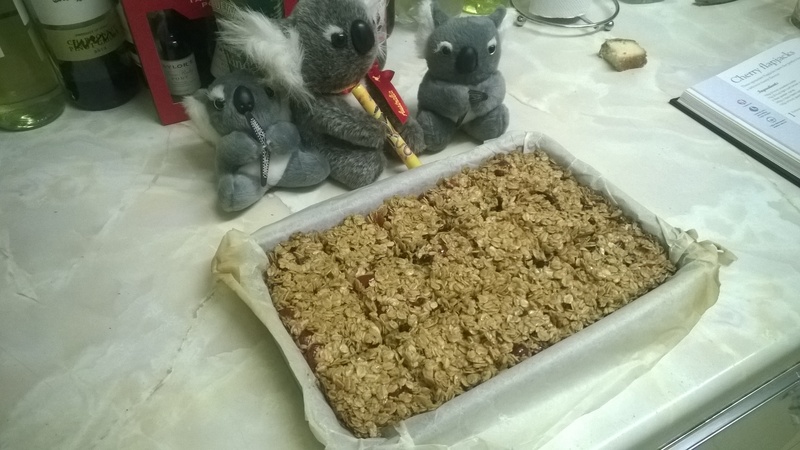 Fortunately, my friends and colleagues are, for the most part, sensible people and the only minor concern with the flapjacks came from the cherries I used. The recipe called for glacee cherries and mixed fruit. I’ve always felt a little uncomfortable about mixing things like raisins into stuff like biscuits and flapjacks – it just feels like I’m making a bowl of muesli, letting it solidify and passing it off as baking. However, I didn’t want to have just the glacee cherries on their own. As you may have gathered from previous recipes, I’m quite keen on cherries. They give a wonderfully sweet and firm texture to things like fruit cakes and whatnot but alone, they’re cloyingly sweet and lack the flavour of a natural cherry. 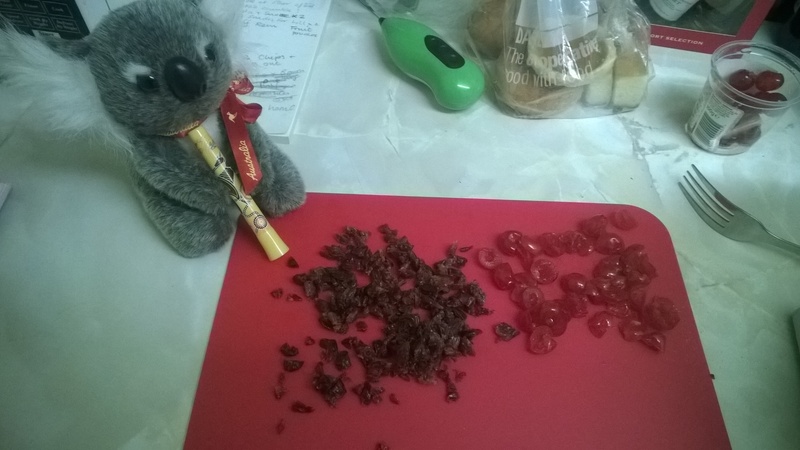 To counteract this, I used some dried morello cherries together with the glacee ones. Dried fruit has the opposite issue – wonderful flavours but not very sweet. The chewy texture of them can also be unpleasant, so if you’re making fruit flapjacks, dice your dried fruit up as this distributes the flavour more evenly throughout the cereal. Its quite a big difference when you think about it. This is certainly one of the easiest recipes I’ve done. 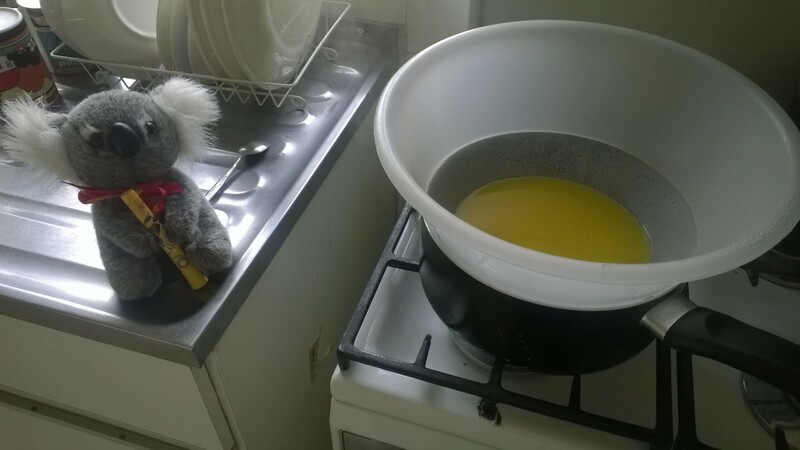 The first stage is melting the butter and adding the sugar and golden syrup. It doesn’t need to be boiling – just hot enough so that it melts together. 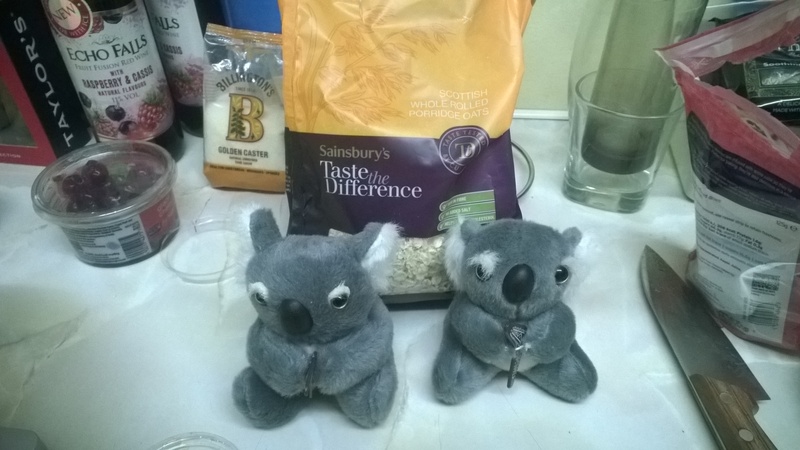 Once the binding mixture had come together, it was a matter of weighing out the oats and stirring it all together. Taste The Difference. Well, one tastes of oats, the tastes of furball. As you may have noticed, I made a mistake with the sugar, thus proving that there is no recipe so simple that I can’t screw it up somehow. 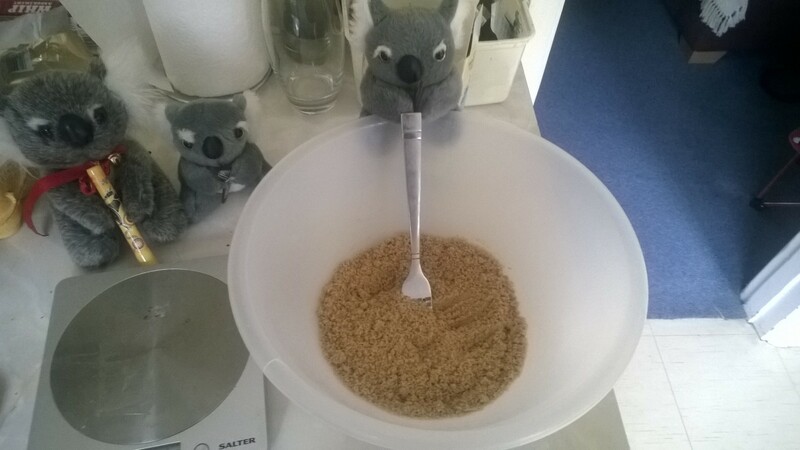 My mistake was that instead of using the dark brown sugar as the recipe instructed, I mistakenly bought some golden caster sugar instead. When I poured the finished mixture into the tray I was extremely worried about the fact that it wasn’t binding together well. After 25 minutes on Gas Mark 4 and some cooling time, it seemed much firmer. I’d gotten the measure of fruit about right as well and the flapjacks turned out pretty well for an hour’s worth of frantic baking. The finish flapjacks, ready for an adventure to the desolate wastes of Newcastle. I wasn’t the only baker at the meet-up. A friend of mine who goes by the online name of Snowfire also enjoys messing around in kitchens.. He also makes brownies that are absolutely stunning; moist, light and straightforward. They are always popular at the meet ups. In the same way a drowning swimmer is popular with sharks. 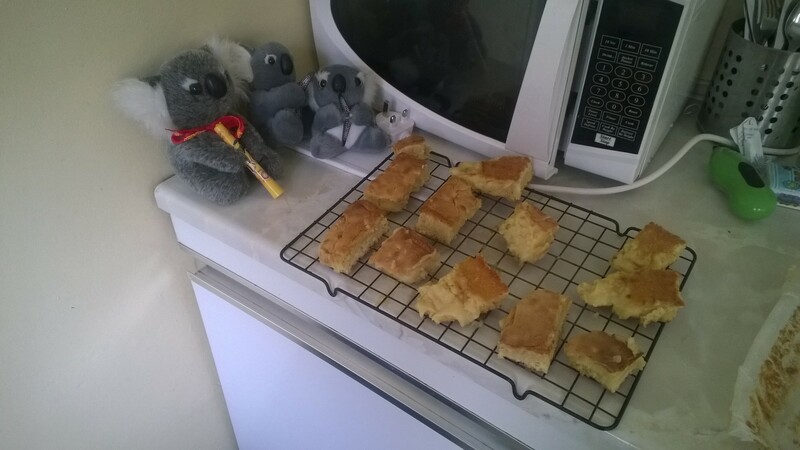 They are made to a secret family recipe and so far he has resisted all my attempts to weasel it out of him. My attempts to koala it out of him might be more successful. 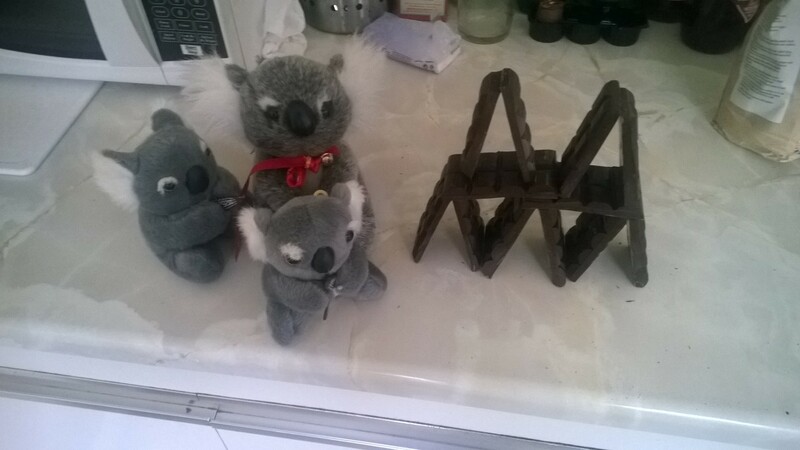 The Koala was missing. 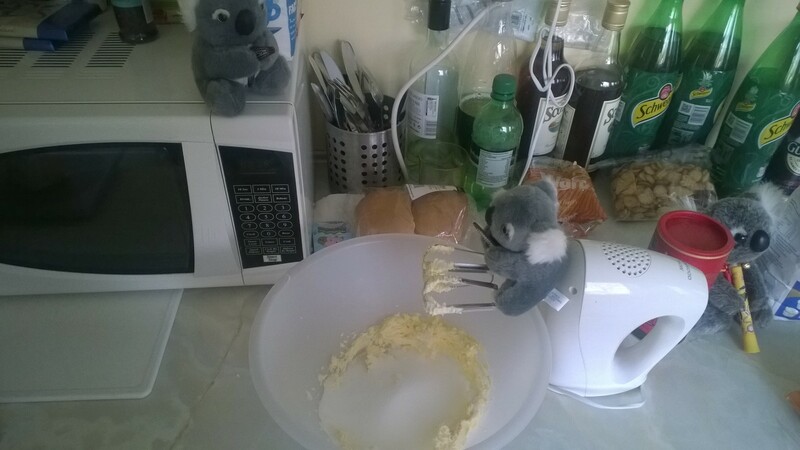 The Koala was missing. I did what any sensible person would do: run round and around my bedroom turning everything upside down while muttering obscenities. No sign. I slumped in my chair, feeling awful. 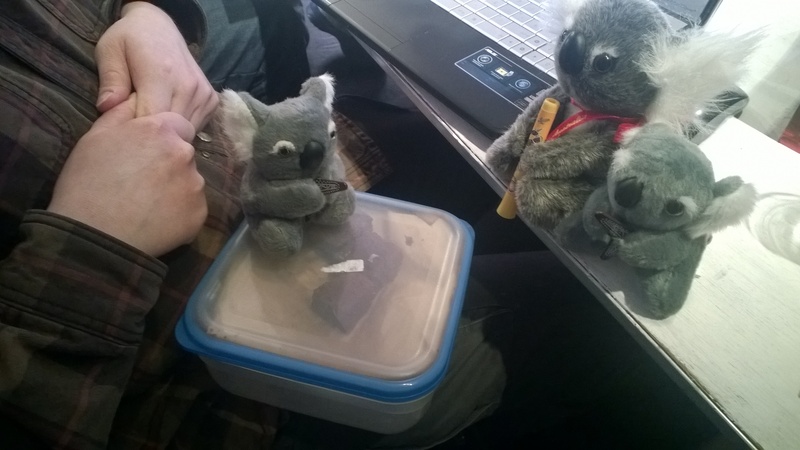 Had he been Koalanapped on the train? Had he decided to live at Kings Cross station like an Australian Paddington bear? 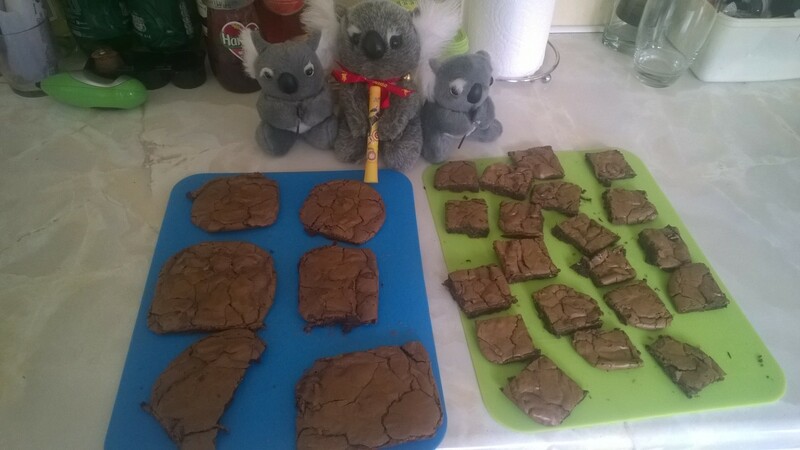 Was Snowfire even now being stalked by a brownie-fixated marsupial?! It suddenly dawned on me that even though I wasn’t saying a word, the foul language was still continuing. 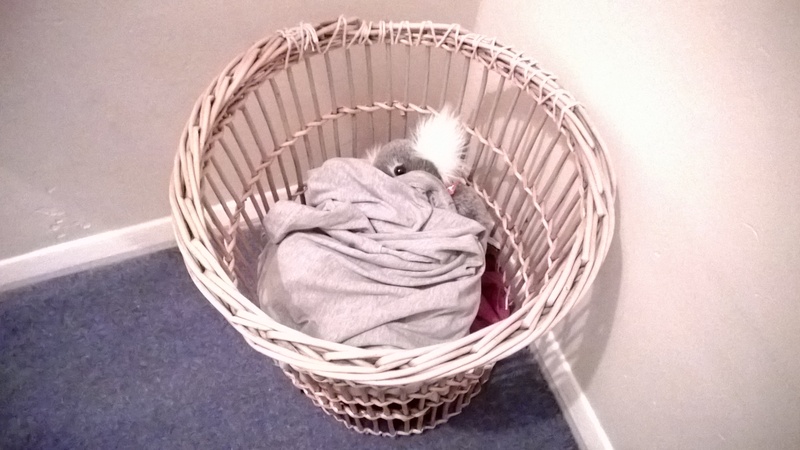 Continuing in fact, from the direction of the dirty laundry basket….